Man spends year 3D printing Honda CB500 replica « Adafruit Industries – Makers, hackers, artists, designers and engineers! Do you remember Christmas in the 1980’s? We do, it was a decade of eager faces opening up the latest Airfix model and families filling the void between Boxing Day and New Year’s Eve (five days where none of us know what day of the week it is) creating little works of art. Christmas right up until the mid-nineties were like this for many households. All with shelves full of Spitfire’s or Nortons, lovingly created by hand. Those of us who remember this have sadly grown up over the last decade or two. However, our love of Airfix hasn’t. Unfortunately, regulations have got so insane that now the glue doesn’t work and the paint doesn’t stick. So our passion is soon dampened and New Year’s Day kicks off with a lineup of monstrosities all destined to the bin, replaced by Lego Ferrari’s and Campervans. You can imagine how excited we were when we read this fascinating story about Jonathan Brand. A New Yorker who took his love of art, engineering, and motorbikes to an incredible level. 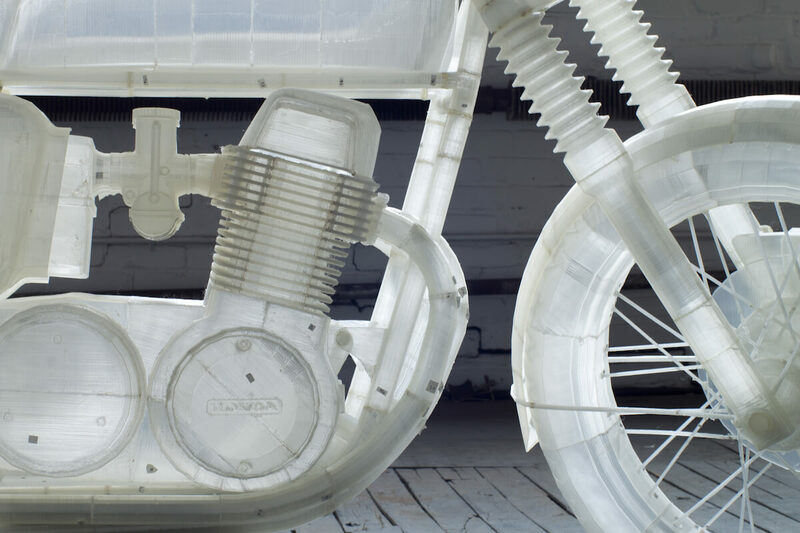 Over 12 months he painstakingly recreated a 1972 Honda CB500 from 18 rolls of corn plastic using, the most fantastically named machine ever, the Ultimaker. Jonathon had decided he wanted to buy a Honda CB500, however with the arrival of his son he thought a better idea would be to create the ultimate homage by building a moving replica using 3D printing technology. Jonathan used two Ultimaker 3D printers, starting by creating specific digital files of the parts for the CB500. Each piece was individually printed, taking up 18 rolls of biodegradable corn plastic. He wanted to maintain transparency to help highlight the beauty of the engineering, so every single piece had a one-millimetre depth. This resulted in the whole bike weighing less than 20kg! He started with 18kg of plastic so are assuming that he used 2kg of glue!